If it doesn't get photographed, did it happen? This summer I was trying really hard to get ahead with my outfit photos. I wear clothes seven days a week, I only post five of those days. I thought a stockpile of photos could be had! And it was going so well, until rain and a busy schedule got in the way. Now I'm down to only one. A couple weeks ago when my photos got rained out, the following night I took that outfit with me to the beach. I photographed what I was wearing that day, then ducked into the changing rooms, did a little outfit swap and took more photos. Maybe that was a little crazy and a little awkward, since I know a few people noticed my photo taking and subsequent wardrobe change. But when a really good outfit happens and doesn't get photographed, what do you do? I absolutely hate when that happens - I feel like it was such a waste of a good outfit...lol as crazy as that sounds, I mean, we still have to get dressed every day...but I know you know what i mean. Love this skirt. and glad you didnt waste this shoot. Well what I do is throw a huge fit and complain and moan about this to my boyfriend. What I end up doing is just saving that outfit/have it out and over the weekend when I have more time I photograph and then write a post. LOVE the red pencil skirt - so cute! Love the outfit and your puppy Chloe looks similar to my puppy Harley! That dog leash really steals the show! I am lucky if I get photos 4 days a week, so I admire that you can get them up so regularly. No doubt! That is too funny! I wonder what those people were thinking but who cares because you look fabulous and chic! It's totally not weird to change your outfits and keep taking pictures--especially if the light is right, or something else! Besides, that really is a good way to get some picture taking out of the way... and then if there was a day when your pictures didn't come out as you liked, you could have some back ups. Sounds like a good plan to me. ps) I'd totally be honored to give your dog a haircut with a lemon wedge. She'd be lemony fresh. The people at the beach may not understand, but believe me all of us style bloggers TOTALLY understand. I hate it when I wear a great outfit and don't get a chance to take a picture--it's like it didn't happen! I'm glad you got this one photographed--that red pencil skirt is a stunner! I love the simplicity of this outfit...and the shoes as the surprise focal point. I struggle with this all the time especially given the nature of my blog. I have now accepted that I can't post every outfit with my time constraints but, am happy to get up what I can. I love a good black, white & red outfit. And those shoes are too cute! Love your heels! I really feel bad if an opportunity like that gets lost! Of course, I'll have to wear it some other just for photography sake, and that's too much of a chore to me! those may be the cutest shoes I've ever seen. If I put together a cute outfit and cant photograph then I just save it for the weekend and snap pics then. I've done that before - I just can't let a good opportunity go to waste! Cute and lady-like, nice balance! Oh, I love those shoes! 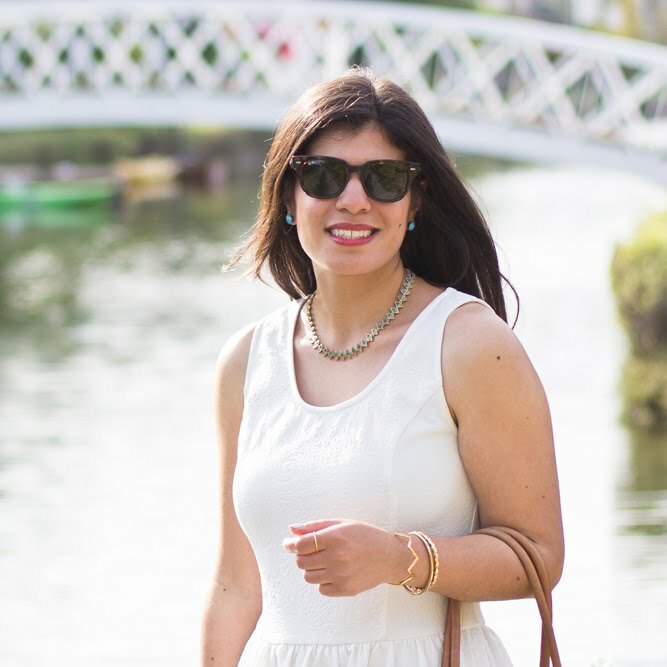 I'm so amazed by bloggers who can post outfits everyday- I'm barely averaging one a week! Also, loving your red pencil skirt! Your red pencil skirt is amazing; perfect fit. And those shoes are just so great. I love them every time! and that is def a good outfit! So ... I am convinced that I need a bright red skirt now. It's beautiful, and it photographs wonderfully. Um, how cute are those shoes!? LOVE. You look so pretty in red! Cute outfit and adorable dog! I do feel like I am missing out if I don't take photos everyday. When we took our hiatus, I had some great outfits but never photographed them. Oh well, life happens. I'd do what you did and get that outfit photographed. Your red and white look is classy. Cute dog! Chloe is so cute! I find taking photos every day I have to take photos inside or when it's dark if the weather doesn't co-operate, so I never show off the outfit as well as I could if it was outside in the sunlight :( Would be good to just shoot them all on sunny days but I only decide what to wear the night before! love your look your sandals are fabolous! This color combination looks lovely on you,it complements your skin tone beautifully.Your dog is adorable!!! I'm still extremely shy to take pictures in public i give you pros for doing it most of the time.There are days i miss the oportunity of taking pictures of my outfit when that happens i always try to re-wear the same outfit on another day. I am not good and getting a stockpile of outfit pictures though I think it'd be amazing if I could get enough stocked up. Usually I post what I am wearing the day I wore it. I had a small stockpile once but that lasted maybe a week?! Love those shoes! They are so cute and so is Chloe. I'll usually just re-wear an outfit and take pictures in a couple weeks, since I figure nobody notices. I like the skirt! Lydia, first I pinned you, which is my highest blogger compliment. Plus I have a red skirt and a white shirt, and I think I can do this chic thing! Second, thanks for discussing your photographing in advance. I try to be honest about what I'm wearing, since I'm blathering on about getting dressed for work on a budget, but some days I have clear skies and a camera operator, and other days I have what I call "mud", mostly self-photography pics taken beside my desk on the fly, not the greatest images, and frustrating to someone trying to get the most out of her first DSLR. I think if I plan my week a little more in advance, I can get some extra pics when I have help and good weather. Such a classic look. I love it! hahaha! I would totally do the same thing, Lyddie! Those heels are BEAUTIFUL! I've worn an outfit again so I have an excuse to photograph it. Sometimes, if it is too cute and I know photos can't happen that day... I set it aside to wear another day, haha. LOL! I do that wardrobe switch thing too! Don't want to waste a good outfit. You look great as usual and I really like the cherry pumps. That's been happening a lot over here since it rains on our days off. I just don't have the energy to get dressed again though. :/ I really like your cherry red skirt and this outfit looks great on you. that color on your skirt goes so well with your dark hair and dont even get me started on the adorable pooch! This must be the most amazing skirt ever. I love the cut and the colour. You look stunning, darling. I can't tell you how many times I've had to re-wear an outfit later in the week just because I forgot to get photos of it when I wore it the first time! This is a great outfit - it's super classy looking. I feel like it would look great at work or for a nice dinner out. Red is an absolutely gorgeous color on you! Have I told you that? I feel like I have. Anyways, I love the contrast between your top and skirt too! Fabulous as always Lyddie. Girl!! you are look hot, red hot!! :) And Hi, Chloe!! You are too cute. Those shoes! Oh those shoes! I need them, SO cute! Obviously you wear it again, even if it's only to take pictures! I feel like I haven't been taking enough photos lately... or just that my wardrobe is tired and I keep wearing the same things. Also, it's hot, not that that is really an excuse. It happens to me all the time! I just try to think of another place to wear the outfit so I can get some pictures. I am glad you got this one.